The 2018 Winter Olympics is now one week old. Competition has not disappointed, and in some cases, gone as planned. Team USA’s first gold medal went to the 17-year-old snowboarder Red Gerard. Gerard is the youngest American male to claim a gold medal at the Winter Olympics since 1928 – who saw this one coming? I had a front row seat when Gerard joined Willie Geist on the TODAY Show. Chris Mazdzer made history in the men’s singles luge as he took home a silver medal and became the first American to ever place. Female snowboarder Jamie Anderson defended her slopestyle competition title cruising to another gold medal. Anderson is the first woman to win two Olympic gold medals in snowboard. Chloe Kim became the youngest woman to ever win an Olympic snowboarding medal when she won gold in the women’s snowboard halfpipe. She turns 18 years old in April. Shaun White brought home his third Olympic gold medal after crushing the men’s snowboard halfpipe. This comes just months after needing 62 stitches in his face. Moments after receiving his medal, I had a chance to spend some time with him on our way to NBC’s TODAY Show set. Team USA has totaled eight medals in all, while Germany has 15 and Norway has 18. How about your DMV Olympians competing at PyeongChang 2018? I’ve been following them closely. Elana Meyers-Taylor has been preparing for competition which begins Feb. 20 from 6:50-8:45 a.m. ET. Garrett Roe and USA ice hockey are already in full swing with Olympic competition. The team is 1-1 through two preliminary games, including a 2-1 victory over Slovakia. Maame Biney, the first African American woman to qualify for Team USA in speedskating, fell short in her four-person quarterfinal heat with a time of 44.77 seconds, 1.28 seconds away from advancing to the semifinals. Biney is set to compete in the women’s short track 1500-meter competition Feb. 17. I caught up with her the night after failing to qualify inside NBC’s TODAY Show green room. She remains upbeat and already motivated for the 2020 Games in Tokyo. Thomas Hong, along with teammates Henry Krueger, JR Celski and Aaron Tran, finished third in the 5,000-meter short track speedskating relay heats on Feb. 13. The finals in the men’s 5,000-meter relay is slated for Feb. 22 from 5-7:45 a.m. ET. Hong will compete for his first Olympic medal while representing the state of Maryland. Freestyle skier, Ashley Caldwell, came up short failing to qualify for the women’s aerial final. Here is video of her run, courtesy of NBC Olympics: http://www.nbcolympics.com/video/ashley-caldwell-doesnt-qualify-womens-aerials-final. NBCOlympics.com will live stream all Olympic competition. There’s something about the Olympic spirit that delivers special moments time and time again. With the world as its audience, the Games has proven to, once again, be the true pinnacle of sport. Subscribe to my YouTube channel here: https://www.youtube.com/channel/UCJ8cG5WOlVaQ7rQv4Qt3awg? 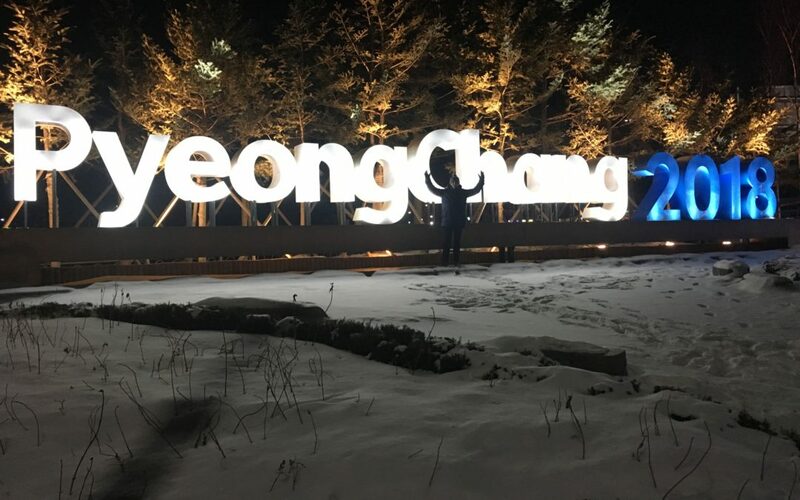 Last night, the small province of PyeongChang took the world by storm as it hosted the Opening Ceremony at the 2018 Winter Olympics. 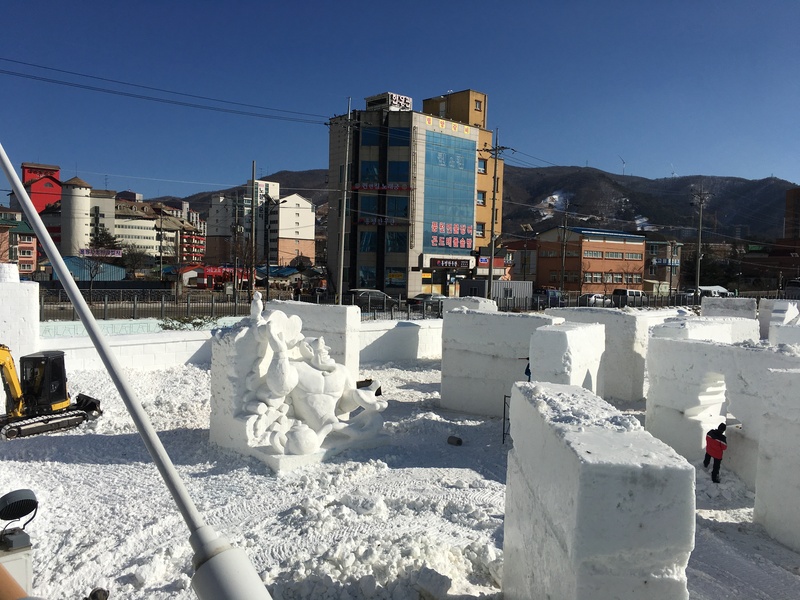 It is well-documented by now that the Koreans have placed a major emphasis on the theme of unity and its signifance surrounding the Games. On this night, though, unity seemed to be much more than just a theme. Mid-way through the ceremony, Olympians from all 92 countries began to make the coveted walk out to the roars of the Olympic Stadium, each led by an esteemed flag bearer. There were plenty of memorable moments to keep the internet busy. The Nigerians are represented by their bobsled team for the first time in the country’s history. The Russians entered the stadium led by a neutral Olympic flag hoisted in the air. They sported plain white uniforms with no sign of the country’s flag. This, of course, is a direct result of Russia’s doping scandal. Pita, the shirtless Tongan who took social media by storm at Rio’s Closing Ceremony nearly two years ago, makes his Winter Olympics debut in cross-country skiing. He carried his country’s flag out while shirtless and in sandals, naturally. The USA broke a Winter Olympic record qualifying a grand total of 242 athletes. Erin Hamlin served as flag bearer. The defining moment of the Opening Ceremony came when the 92nd and final team made its historic march. The North and South Koreans entered the stadium under one unified flag. Together. As conflicted Koreans digested this powerful gesture, the rest of the world was introduced to North Korean civilians in the most epic of ways. I had a chance to take all of this in with several of my new local Korean friends. Historic. Surreal. Emotional. Captivating. The 2018 Winter Olympics. Buckle up. It’s about to be a magical 18 days at PyeongChang 2018. 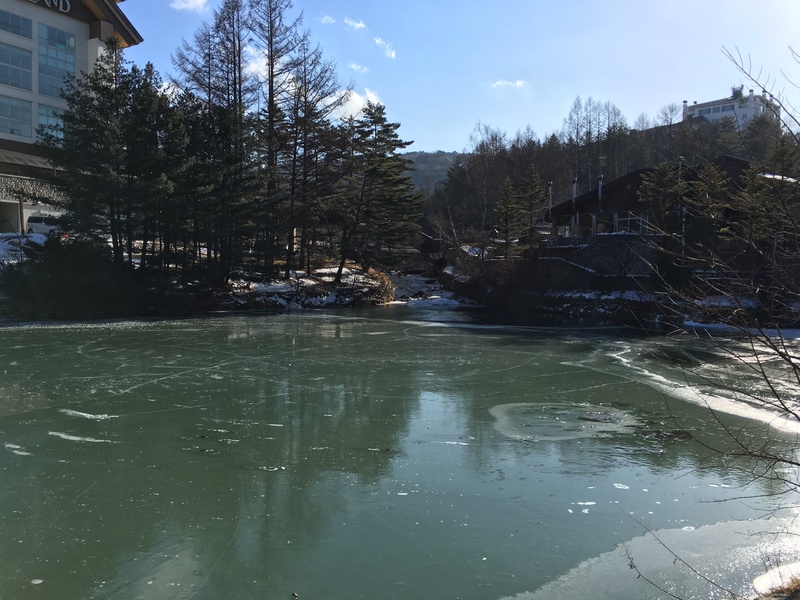 We are just days away from the start of the 2018 Winter Olympics in PyeongChang, South Korea. It is the country’s first Olympics since the 1988 Summer Games in Seoul. The Washington-area has been well-represented in recent years and is widely known as one of the most dominant regions for athletes to come out of. Three of the four Olympians are making their debut, while Meyers-Taylor appears in her third consecutive Winter Olympics (Vancouver 2010, Sochi 2014). The Olympics opening ceremony will take place on Friday, Feb. 9, beginning at 8 p.m. local time (6 a.m. EST). Don’t worry, NBC is airing the full broadcast at 8 p.m. EST later that same day. Katie Couric and Mike Tirico are set to host the event. Now that Super Bowl 52 is in the rearview, it’s time to jump on the PyeongChang 2018 train. An event unlike any other. Subscribe to my YouTube channel here: https://www.youtube.com/channel/UCJ8cG5WOlVaQ7rQv4Qt3awg?view_as=subscriber. One 15-hour flight to Seoul, South Korea. One two-hour block gathering all of our jet lagged NBC crew together in the midst of large Korean crowds upon arrival. 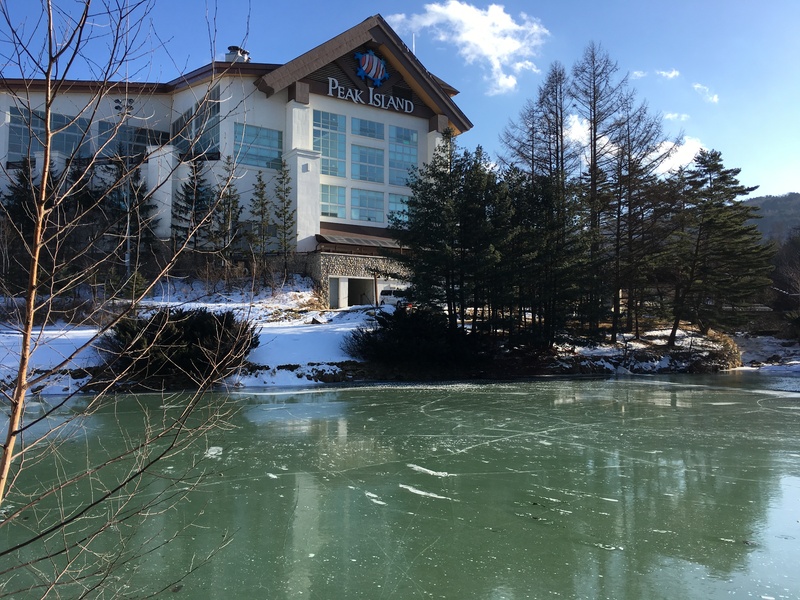 One three-hour bus ride from Incheon International Aiport to the site of the Winter Olympics — PyeongChang in Gangwon Province. 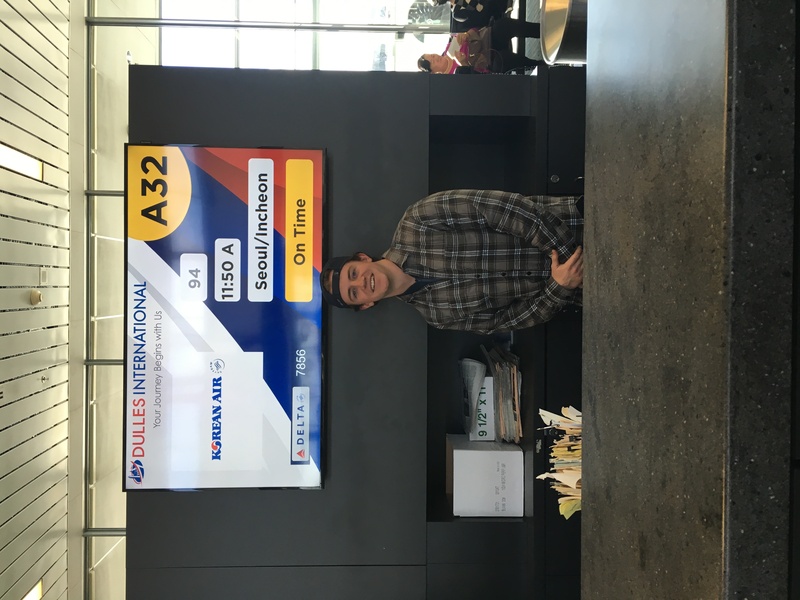 This was the itinerary set in place to reach PyeongChang 2018 from Washington, D.C. The quick turnaround starting work the morning after arrival was worth it. 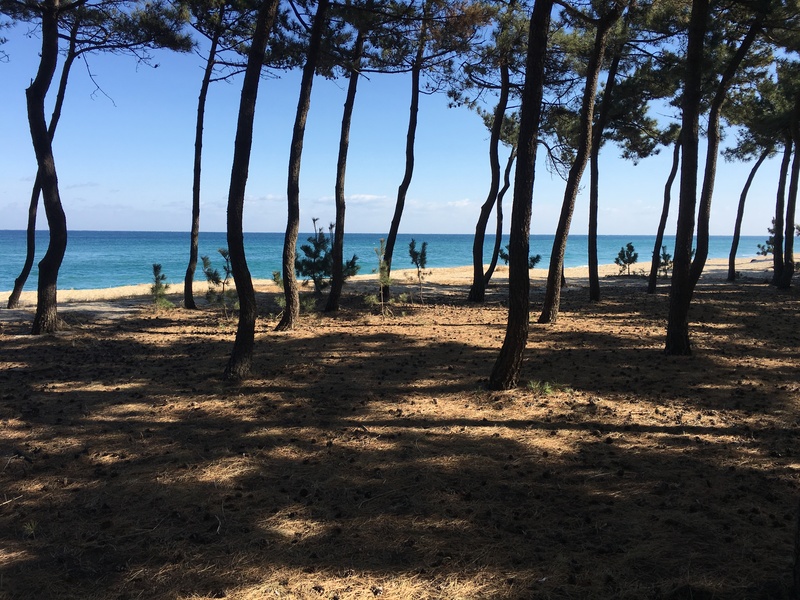 PyeongChang is on the very edge of South Korea’s east coast, about two hours from Seoul by train (Seoul hosted the 1988 Summer Olympics). Far, far away from the coastal area is the Alpensia Resort looking down over the entire town and beyond. 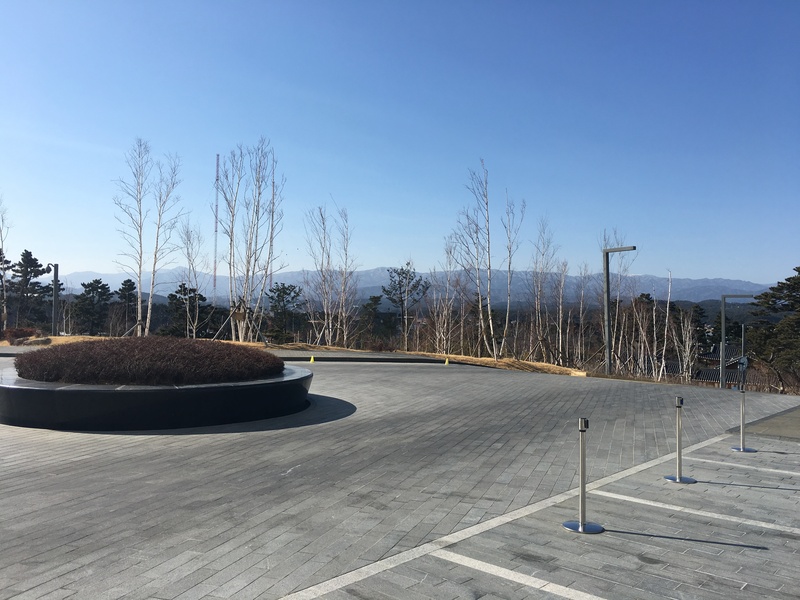 On our way up to the top of the mountain, we stopped by a beautiful part of town right outside of PyeongChang’s Olympic Stadium. 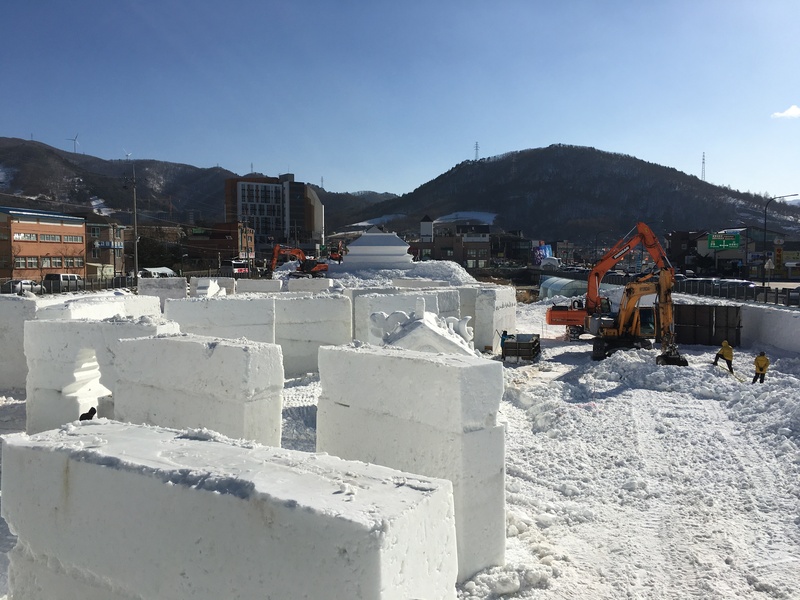 Korean workers were sculpting these massive blocks of snow while on top of a frozen river that runs right through the middle of town. 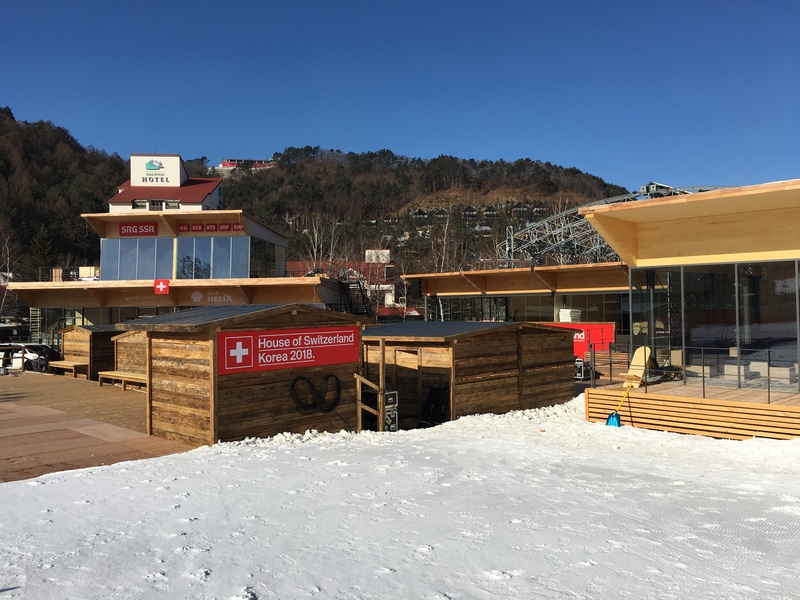 One of the unique things about the Olympics is the fact that every representing country has a ‘house’ for athletes to gather in and hangout throughout the Games. 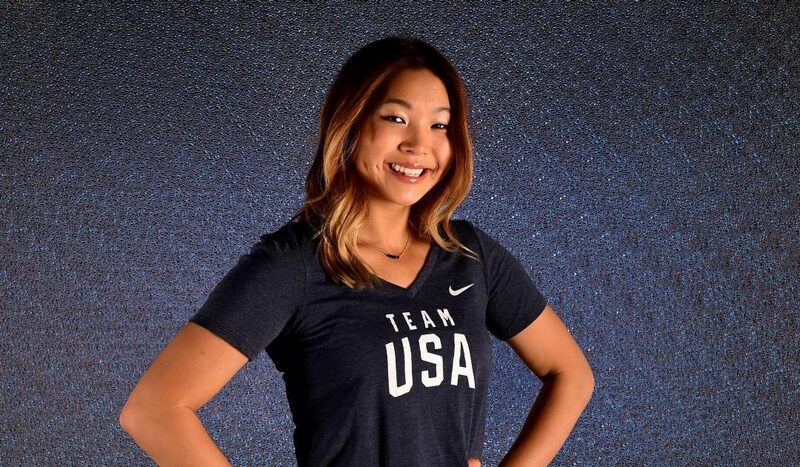 17-year-old snowboarding sensation Chloe Kim was just 13 years old when she was deemed talented enough to compete in the 2014 Winter Olympics. Her young age, however, was the ultimate deciding factor which left her watching the Games from the couch. Four years and a boat load of X Games success later, Kim is set to now make her Olympic debut in the country where her parents grew up. We touched on topics such as her Korean-American heritage, Shaun White Comparisons, how she’s feeling about her debut and much more. 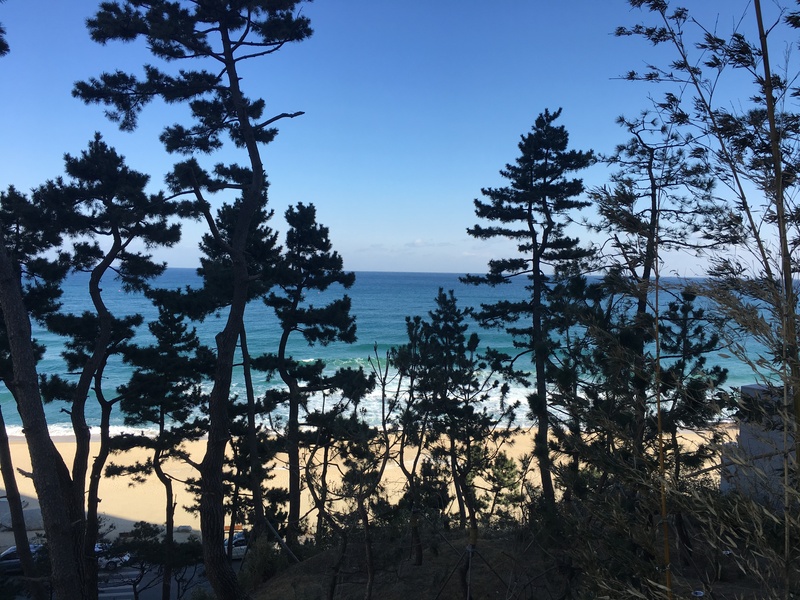 I leave for South Korea 1/27 and return 2/28. 16 days, 10 hours, 10 minutes to the start of the Winter Olympics…. 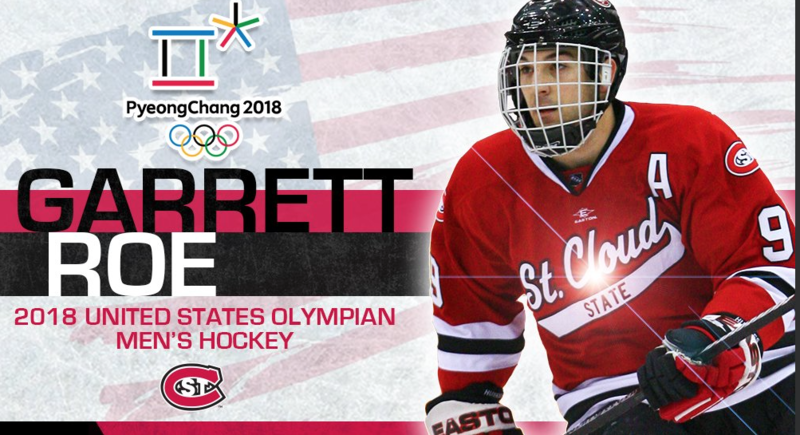 Garrett Roe is set to represent Team USA in men’s ice hockey at the 2018 Winter Olympics in PyeongChang, South Korea. He called in to NBC Sports Washington’s podcast studios to talk to me about what this accomplishment means.